The type of personal information we collect from our website is restricted to the information you enter during registration. This information will ONLY be used to assist us in processing your order (eg Name,address, phone and email given to Australia Post or a registered courier to enable delivery). In addition to the information that customers submit via the registration process, this site collects visitor statistics including IP address, browser type, screen size and other related information. This can include using a "cookie" which would be stored on your browser. You can usually modify your browser to prevent this happening. The information collected in this way can be used to identify you unless you modify your browser settings. At no point will this information be rented, sold, given freely or used for any other purpose besides internal record keeping and statistics. It may be necessary for a CraftBrewer staff member to contact you on the number you provide regarding the status of your order. Please ensure that the information you provide during the registration process is accurate. 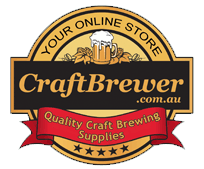 CraftBrewer uses the return email addresses from your email correspondence to answer the email we receive. Addresses from correspondence to us are not used for any other purpose and are never shared with any outside parties.